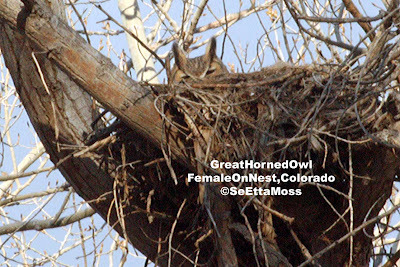 Female Great Horned Owls are "on the nest" all around eastern Colorado. 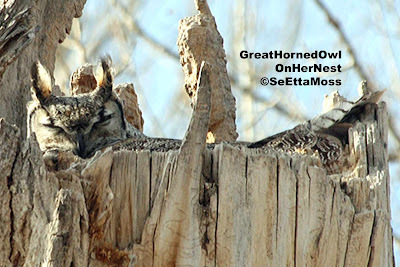 I have been owling around south central Colorado for about a month and have found 2 Great Horned Owls on nests including the one in this photo that is sleeping or at least resting with her eyes mostly closed. Double click on the pic for a close-up which reveals her left eye slightly open, evidently aware of my presence though I always try to be as quiet as possible (the darn digital cameras make noise when the shutter is snapped that is clearly noticed by some birds). This is the type of impact that is often unseen or ignored by birders and especially bird photographers. Not only I but other Colorado birders have reported owls on nests for the past few weeks.Besides the 2 on nests, I have seen 3 other Great Horned Owls in 2 counties. I also spotted a Western Screech Owl. I had some software and other problems, so haven't posted for a while. 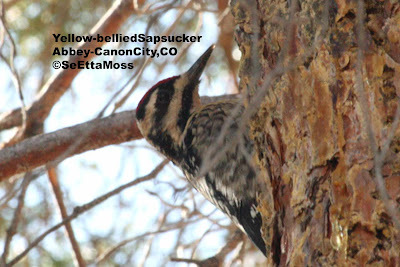 Though the Canon City area, as well as most of eastern Colorado has been in a "abnormally dry" (per weather service, I think it's part of continuing drought cycle)period for months which has impacted a number of birds, at least one Yellow-bellied Sapsucker is still here. Actually I saw 2 days ago after trying several times unsuccessfully. This female is exceptionally skittish.